I want to thank all of you who participated in my end of the year technology questionnaire, the response has been great. I will be sharing the results in a future post. If you haven't participated yet there is still time, all feedback is greatly appreciated. Click here to go to the survey. It is just 8 quick questions. Summer is the perfect time to relax and re-energize in preparation for the new school year. I know there are tons of great activities occurring across the district and I encourage all of you to think about what you do and make it a goal to share it in 16-17. In addition, I believe that all teachers have favorite sites they go to for resources, let me know what you use and how. I bet there are others who could benefit from your favorite sites too. For 2016-17 my blog goal is to encourage more sharing of resources and activities across the district by all staff. As for my summer blog goal, I am seeking apps. If you know of a really good app or find a great app during your summer browsing, send me a email and let me know about it. Enjoy your summer! I am hoping while you are relaxing by the pool or at the beach you will have time to go back and check out all the great resources posted this past school year. The more we share the more opportunity we all have to grow together. Mrs. Gantz has been busy modeling technology in many ways. She shared pictures of her students doing a 3D shape hunt. One group found a cylinder and another group found a rectangular prism. She had the students follow up the picture taking activity by using Skitch to add labels to their pictures. In addition, she used iMovie to create a movie trailer of her student's trip to Strawberry Hill. I am sure the readers seeing this can think of tons of ways to creatively engage students with iMovie or other video creation tools. See Mrs. Selby's video below too. Thank you to Mrs. Gantz for sharing your activities. Mrs. Gantz used iMovie to create a video trailer of her students trip . Click here to see the final product. Animoto is an easy to use tool and a great way to create a video in for this showcase a field trip. If you are looking for ways for students to show creativity and demonstrate understanding, consider Animoto as a means for them to present the steps in a lab experiment, record the steps to solving a math problem, presenting their understanding of the judicial process, and on and on, the ideas are endless. Check out Mrs. Selby's Animoto of her second grade class trip to Strawberry Hill. Thanks for sharing the great tool! Mrs. Selby's 2nd Grade click here to see the final product. Mrs. Weikert - 7th Grade Math - Quizziz - FREE! Mrs. Weikert invited me in to see a new tool she was using with her students. It is quizizz.com/. Here is an overview of how it was used. students compete individually to answer questions. The questions are self-paced. Students receive points for being correct, but they receive higher points for answering quickly. The computer tells students their rank after each question. Final rankings are determined after all students finish the questions or when the teachers decides to end the game. Teachers may create their own questions ahead of time or use questions already created by other teachers. Mrs. Weikert shared that there were a number of items already created by other teachers that she could choose from to get started. She also like the fact that the students could join with a pin number so she didn't have to do much with regard to set up to use this tool. As you will see by the video, the students were very engaged. This would be an excellent tool to use across any content area for review and practice. I took a quick video below in which you can see the focus, excitement and ongoing emotions the students displayed while working with this tool. They really seemed to be motivated to do well. Mrs. Weikert - 7th Grade Math Quizletlive - FREE! Thank you to Mrs. Weikert for sharing another great tool. Below is an overview of how it worked. ​quizletlive.com - Students compete in teams of 3-4, which are randomly assigned by the computer. The first team to get 12 correct answers is the winner. However, only 1 person in the team will have the correct answer on their screen. Students must collaborate to decide who has the correct answer. Teams who enter an incorrect answer lose their points and start over with zero. Teachers may create their own questions ahead of time or use "study sets" already created by other teachers. This would not work in a computer lab because students must be able to move after logging into the game to sit with their teams as assigned by the computer. Every time you start a new game, the teams are reassigned so students will need to move again. I love the fact that this would work in any content area for review or informal feedback. Mrs. Weikert shared that this tool was also easy to use in that the students joined without her having to type in all their names. She said that at the end of each session she saw there was an option to export the information from the session. I also loved the fact that students worked in random teams that were computer generated and that each had a possible answer but only one was correct and together they had to determine which member of the group had that. Thank you Mrs. Weikert for sharing these two wonderful tools for K-12. These are two fantastic tools to engage students! Apps for Science Teachers - All Are FREE! 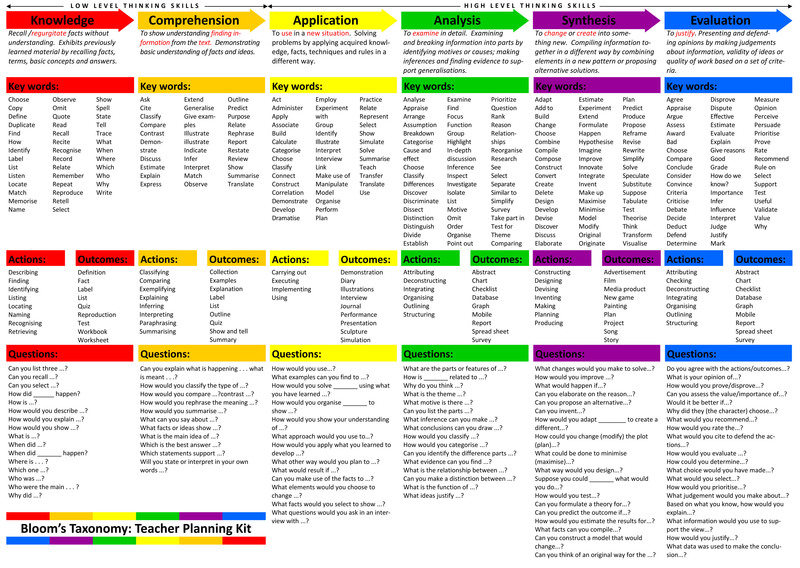 I thought this was a really good resource because it takes each level of Bloom's and shares the keywords associated with the level and also provides objectives, actions and questions specific to that level of Bloom's Taxonomy. Click here for the link to the actual site. This is a nice cheat sheet to keep handy as you develop your lessons and assesments. I came across this cool resource that allows teachers to create video lessons in a quick and easy way. It's called theLearnia. You can sign in with your google+ (school google account) and you will see three tabs at the top of the screen. One will give you a quick overview of how it works. The second walks you through the steps of creating your video lesson and the third tab directs you to some featured lessons so you can see what a finished product looks like. I looked at it briefly and saw that you could upload your PowerPoint slides or it looks like you can choose a template and create your lesson from that. This is a free resource and I think it's definitely worth checking out as it looks to be an easy one to use. Google Presentation Q & A - So Cool! Thank you Joanna Knott for this weeks showcase tool. On May 4, 2016 Google announced a new feature with Google Presentation. Joanna shared this brief video showing you what it looks like. Click here to see what it looks like. It is so cool. It gives the classroom teacher the capability of having a backchannel like feature while you are presenting your lesson using Google's Presentation tool. Students no longer have to raise their hand or be shy about asking questions because they can simply post them for the presenter, teacher, to see. Others can vote on the questions asked giving the presenter, teacher, the ability to see how many others have the same question. It also gives the creator of the presentation feedback to consider incorporating for the next time they give the presentation. In addition, the questions can be archived. So, if this interests you, here is a quick tutorial on how it can be done. In addition, there is another presentations tool, a laser, that has been incorporated into Google Presentations and you will see that in this how-to tutorial. Click here to learn how to use the Q & A feature. Below I have included a step by step document for using the Q & A for those who like to have written instructions. Click here for step by step Google Doc instructions. Looking for educational materials on Youtube. You can go to Youtube.com/edu where you will find videos already sorted out by Primary and Secondary Education. Thank you Mandy Haugh for sharing this tool. Read what Mandy shared about how she uses Thinglink with EL students. Maybe you could find ways to use it with your students? "I just wanted to share a cool resource that I think would be great for our ELs. It's called Thinglink. It's SO cool! It's basically a virtual bulletin board with clips/links/text, etc. to explain concepts. I found it online when I was looking for materials to support a 4th grade ELA class. I think it has many uses, but the one I'm attaching is good for building background knowledge for our kiddos before reading a story (I didn't create it). I've started to experiment with making some boards, and it's super easy. I only signed up for a free account so far. You're also able to search other Thinglinks on the site that are already created. I hope you find it interesting!" Resources, Resources and More Great Resources - All FREE! I am excited about the items I have shared this week. Please take a few moments to check them out. I have resources for all teachers K-12. Even though we are coming to the end of the year, I am not running out of great things to share. As always, I would love to come out to your classroom to help implement a new tool or model a tools use or just collect information for a tech showcase for the blog. Don't delay, call me today! NoredInk is a site designed to help students become better writers. It's free and students don't need to create an account to use this site. The teacher creates the account and sets the activities that the student will work on. There is a diagnostic activity available. Noredink Another nice feature of this resource is that you can use your Google login. Students can log into the teachers account with a pin given to them by the teacher. I think this is a great tool for students. What a cool way to do a quick assessment with students. Recap allows the students to quickly record a response to a quick check for understanding or maybe an exit ticket. It's a fun and engaging way to hear and see what students are understanding. letsrecap If I were in the classroom, I would love this site, I think students would love it. Sign up, it's free and you can check out the demo to see what it's all about. Settle the Conflicts Between Hamilton and Jefferson. In the formative years of the United States, two key figures helped shape a new government: Alexander Hamilton and Thomas Jefferson. However, their vision of what that government should be and do often conflicted. In this interactive from PBS Learning Media’s A Biography of America, students read statements by Jefferson and Hamilton on the role of government, the virtue of people, the institution of slavery, and the role of cities. Then they decide who, in their opinion, had the more enduring vision for America. The website also provides background information and discussion questions to support teachers in using the interactive with their students. Plus: A video segment adapted from PBS’s American Experience describes the early life of Alexander Hamilton. Born outside the 13 American colonies on a small tropical island, Hamilton struggles early when his father leaves and his mother dies of yellow fever. As a teenager, he learns about international finance by working for an export company, hones his writing skills, and witnesses the degradation of slavery. Accompanying the video are teacher support materials that includebackground information and discussion questions. For those looking for professional development in the comfort of you own home. This is free. It looks very interesting. PBS Learning Media and SSEC have partnered to bring the professional development series Good Thinking! to PBS Learning Media's on-demand service for educators. Drawing from peer-reviewed research in science, cognition, and pedagogy, Good Thinking? distills valuable findings from hard-to-access journal articles to promote effective classroom practices. The series is available on SSEC's YouTube channel. It is meant for K-12 teachers the cost is free and the great part is you can participate online; anywhere, anytime. Click here to go to the link to see more. I am sharing three guides for Project-Based Learning. Each guide contains eight ideas for classroom projects, with two ideas for each core subject area. Click here for the link to the Global Digital Citizen Foundation site. Word Generation is a free supplementary curricular resource developed by the Strategic Education Research Partnership for students in grades 4, 5 and middle school. Word Generation offers a series of discussable dilemmas designed to promote students' academic language and argumentation skills. It employs vocabulary learning principles validated by research and includes weekly topics, each separated into four strands--English, social studies, math and science--to connect all vocabulary to their disciplines. Students will debate questions such as, "Should voting be compulsory in local and national elections in the United State?" and "What divides us and how can we resolve our differences?" The topics are intended to engage students and encourage debate. I looked at the downloadable content and the topics do look engaging. Here are the links to grades 4 and 5 and middle school. Click here to see all of the links available including science and social studies. Tammy Worcester Tung has created a Google resource site with lots of tips and how-tos. Click here to access the site. I like that this tool categorizes the vocabulary words as below, on or above grade level. It was so easy to use. This tool is from Student Achievement Partners and uses the vocabulary system described in Isabel Beck's book Bringing Words to Life: Robust Vocabulary Instruction, to identify Tier 2 words. These are high-frequency words, such as analyze, compose, and construct, which appear across several content areas. The Academic Word Finder identifies Tier 2 words in passages to help teachers select the most useful vocabulary to teach their students. To use the tool, Teachers copy and paste their passage into the search field and then select the grade level. The finder quickly identifies below-, on-, and above-grade-level Tier 2 vocabulary to focus on with students. It also provides the grade range, part of speech, meaning, and an example sentence for each vocabulary word.